Match-3 style games can be challenging and entertaining, and the Google Play Store is packed full of them. These games have you creating matches of three or more of the same items to collect points and achieve goals. Some add difficulty to the game by having you race a game timer, while others take a more casual approach. We’ve scouted the Google Play Store to give you one of the best match-3 games for your pleasure. We’re talking about Fruit Jam. Fruit Jam is a fruit match-3 puzzler that can addict any user, offering an interactive experience that is rewarding, creative, and unexpectedly entertaining. The game is launched on the Android platform by Free Match 3 Puzzle Family Games, requires Android 4.1 and up and can be played by both kids and adults. 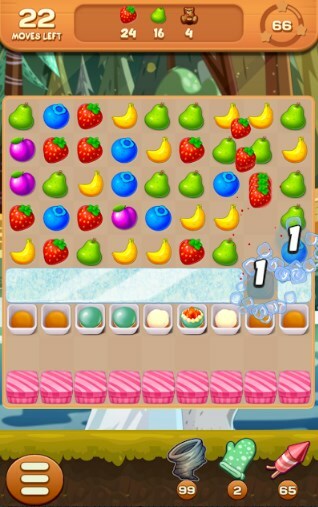 Engage in a never-ending fruit mania, challenge yourself and play for hours! This match-3 game is created to challenge puzzle fans which gives the players a chance to enjoy solving puzzles while challenging their brain to function faster. The main objective is to match the delicious fruits and to progress through levels. You will start playing easier levels, but be faced with harder ones as you play. Just tap the fruits on your screen to match them – match at least 3 fruits in a row to win points and to complete the level. There are tons of levels featured in this game, awesome power-ups and boosters, limited moves to make it more challenging, and so on. Use your smartest moves to become the best match-3 player, download Fruit Jam for free from the following Google Play link and enjoy.